ART REVIEW: "Transmutations: Photographic Works by Carl Chiarenza"
PHOTO PROVIDED "Untitled #126," is part of Carl Chiarenza's photograph show now on display at both Axom Gallery and Spectrum Gallery. Of the transmission of experience through art, poet Robert Frost wrote, "No tears in the writer, no tears in the reader. No surprise in the writer, no surprise in the reader." Though renowned photographer Carl Chiarenza creates abstract works that are purposefully open to viewers' interpretations, the crystallized emotional experience of the artist is present in his works and resonates powerfully within each image. In honor of Chiarenza's 78th birthday, Axom Gallery and Spectrum Gallery are co-presenting a look at his prolific oeuvre, the result of decades of playing amid the environs of his subconscious mind. "Transmutations" is a selection of Chiarenza's work pulled from a body curated by photography historian Robert Hirsch for an exhibition that took place at the University of Buffalo's Anderson Gallery in late 2012. The show chronicles Chiarenza's photography since the pivotal year of 1979, when he shifted from documentary-style photography to creating photographic images entirely within a studio setting, creating collages from scraps of various materials and photographing them with Polaroid-type film. In fact, the last image that Chiarenza shot outdoors, "Rockland 2," is included in the Spectrum Gallery portion of the show. When the artist was teaching a workshop in Maine in 1979, he spotted and snapped a few pieces of warped plywood. Though his artistic approach changed drastically after he made this image, his familiar aesthetic sensibility is present in the serpentine curve of the boards, the bright highlights along the edges of the textured wood, and the lush, dark abyss tugging at the viewer's focus. Chiarenza's images are rife with stark chiaroscuro and a rich scale of silvers set against a void, hinting at moonscapes or landscapes painted by moonlight. 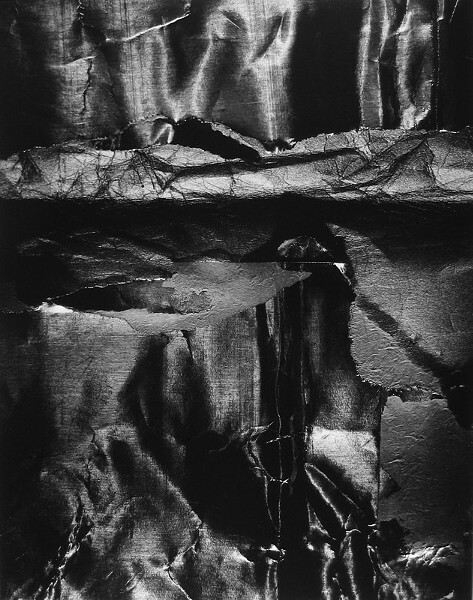 What the artist accomplishes by catching light in the crinkles and folds of layered cast-off materials is astounding. The photographs suggest tangible elements of this world — at Spectrum Gallery, in "Woods 529," delicately rendered trunks and branches emerge glittering from manifold creases in a papery surface, revealing the artist's mastery of generating forms from tiny piles of rubbish. At Axom Gallery, a crisp envelope lip in one work becomes the clear sky above dark mountains, and in another, patterned paper resembles a tree-dotted, snowy hill rising over a lake that gleams with a gently swaying band of moonlight. But the images are also territories of the numinous. Staring into these worlds, I feel the peace of looking on from far away, unencumbered by the silent dramas of any unknowable inhabitants found there. There is beauty, and the pull of mystery, and the passage of time. But this is only one interpretation. At Axom Gallery, the moody image, "Untitled #126," is comprised of carefully arranged bits of gleaming and fibrous material that are transformed into a layered, cavernous space, where time has wrinkled the shimmering, wet stone, and veins of precious metal run throughout. Nearby, "Untitled #11" contrasts many differently patterned materials, and moving back away from it, the abstract forms become perhaps sparkling city lights, below rolling hills, below striated contrails crisscrossing a dark sky. Also included in the show are a few works from Chiarenza's "Peace Warrior" series, which he created in response to his despair over the United States' declaration of war on Iraq more than a decade ago. The artist says it's unusual for him to create representational works, and images with a specific purpose in mind. Having seen many wars in his nearly eight decades of life, Chiarenza is frustrated by our seemingly endless stream of conflicts, and finds refuge in his work. The series, which includes "Don Quixote 190," currently on display at Axom, and "Peace Warrior (Don Quixote) 188," at Spectrum, offers abstracted figures made from torn, twisted, crumpled, and folded bits of metal and fiber, and depicts them in shabby armor, holding makeshift weapons, trudging along or in vigilant stances. Though the figures resemble soldiers in their names and garb, they are bereft of any sense of violence and seem like evolved beings. Similarly, the figures in Chiarenza's Samurai series, represented in this exhibition by "Samurai 329," at Axom, wear worn protective burdens, but are often haloed and surrounded by a whisper of wings, confronting us with a countenance entirely inscrutable. Though retired from teaching art and art history, Chiarenza hasn't retired from creating. He's making a new kind of picture these days, by cutting some of his older photographs and using the pieces to make collages — this time, the work will remain physical collages of photographs instead of becoming photographs of collages. Chiarenza has sent two works in this new series to locations in New York City, and the artist plans to show his new work in Rochester next year. Spectrum Gallery will host A Conversation with Carl Chiarenza on Tuesday, October 1, at 7 p.m.